Born in Glasgow, Thomas Walker studied brass at the Royal Scottish Academy of Music and Drama, where he trained as a tuba player, before taking up singing at the age of 21, going on to study with Ryland Davies at the Royal College of Music, London. 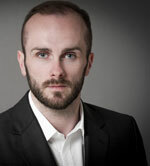 Thomas is a busy and in-demand singer across a variety of styles for both staged opera and concert platform work: not only the Baroque, which forms the bedrock of his career, but all the way through Classical and bel canto, to modern works. Thomas works with opera houses throughout Europe including the Komische Oper Berlin, Stuttgart Oper, Opéra National de Paris and Staatsoper Berlin. His operatic roles have included the title role in Rameau’s Zoroastre, Adam in Scarlatti’s Il Primo Omicidio, Admeto in Gluck’s Alceste, the title role in Rameau’s Platée, and Count Almaviva in Il barbiere di Siviglia by Rossini. He also appears regularly as a concert soloist with ensembles including the OAE and Gabrieli Consort, the Orchestra of the Eighteenth Century, the Saint Paul Chamber Orchestra and RIAS Kammerchor Berlin. He has also sung Britten’s Les Illuminations and War Requiem, Stravinsky’s Pulcinella and Tippett’s A Child of our Time, and has worked with conductors including Sir Andrew Davis, René Jacobs, Paul McCreesh, Ottavio Dantone and Jeffrey Tate. When he is not travelling, Thomas greatly enjoys walking, having completed the West Highland Way and with ambitions one day to walk the 500 miles of the Camino de Santiago. He also has a keen interest in politics and is an involved campaigner for social justice.